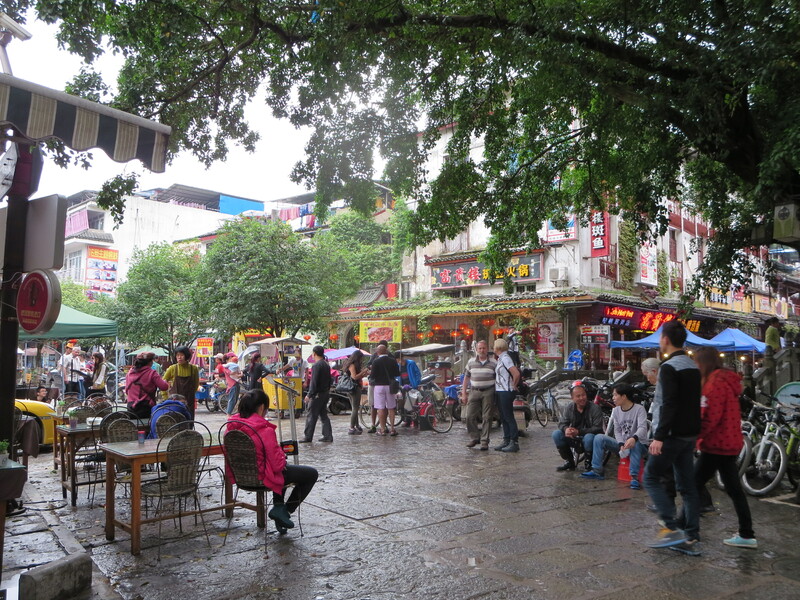 After our river tour down the Lijiang, we (eventually) found our way to our Yangshuo hotel. We napped like the dead for about two hours before rising again to face yet another day away from home. After the minimal primping necessary for any young adventurer, we departed the scenic River View Hotel (complete with courtyard-adjacent rooms! Hear all the sounds of a Chinese kitchen without the hassle of getting the food!) and wandered into the main tourist quarter of the city. Yangshuo is largely laid out like a ladder, with two main streets full of restaurants and market stalls connected by dozens of smaller avenues. The restaurants are eclectic, and cater to every potential traveler, some of them offering German food, Italian food, and American-style pizza on a single menu. The market stalls are pretty average market stalls, with the prices a little bit higher because of how relatively remote Yangshuo is and how many foreign tourists make the journey (in case you were wondering, the answer is many. Many foreign tourists make the trip). The top of the ladder, near our hotel, has a small scenic spot where you can overlook the Lijiang, which was running quite high due to the rain that haunted us during this vacation. The view was breathtaking, and it was nice to get a break from the rapid pace that had dogged us from the moment we entered Guilin under 48 hours before. Take note: If you ever travel around China, you will see people sit like that (like the woman on the right) all the time. This is their resting position and, miraculously, it doesn’t hurt their knees. Amazing. Um…we know relations between China and Japan are not that great, but wow. I was not expecting to see a sign like this in such a touristy city. Don’t eat here. I bet these people are rude. 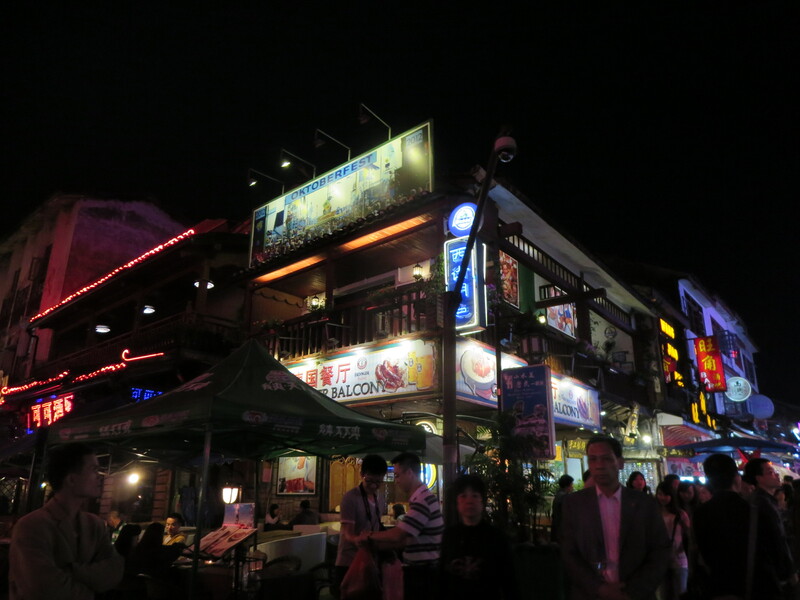 With our hunger sated, we set out once more to wander the streets and take in some of the local nightlife. The nightlife was pretty typical for a Chinese city: the market stalls stayed open late, hoping to take advantage of the unwary traveler, and the poorly-lit-and-always-too-loud clubs, with a maximum of 10 occupants, pumped bad beats out into the street, hoping that volume would win over the hearts of passersby. It might have helped if they lowered the prices for drinks (a single small beer cost us 10 times what we would have paid at a grocery store). At least this bar had free music? After wandering around for a few hours, we decided we would try and find a place recommended to us by a friend: Monkey Jane’s Rooftop Bar. We expected more of the same–loud music, bad prices, mood lighting–but we quickly began to shed those assumptions as the signage took us off of the main streets and in to the alleys behind them. These alleys, usually no more than the width of my arm-span, seem to exist in every Chinese city, and house everything that you could want, from small restaurants to pool halls, gambling dens, hostels, and (fortunately for us) a nice, quiet little bar. 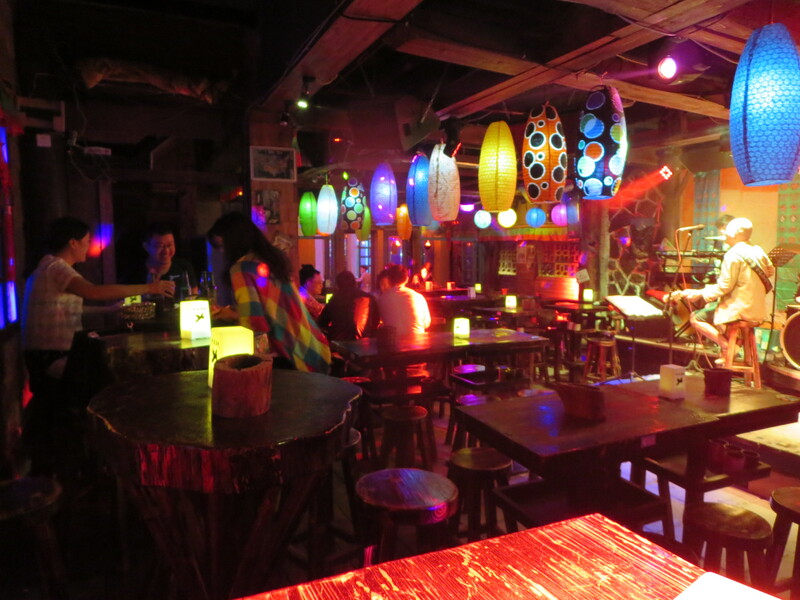 Monkey Jane’s was a great way to spend a night in Yangshuo. The beer was cheap and the company was good. During the few hours we spent there we met Winny, the bartendress (with relationship drama), a group of four young students from Hunan (who were trying to improve their English, but should have been trying to improve their drinking skills–they didn’t order a single drink in the two or three hours we talked with them), and 3 fellow expats from South Africa via Hong Kong (where they also teach English). Adrianna has a habit where she carries fruit in her purse, forgets about it, and then leaves it on a random table in a bar or restaurant. She’s strange. Winny really liked Adrianna’s hair. We wiled away the night drinking, talking, and generally being sociable. It was cheap, great, and a complete departure from the fist-pumping, high priced club scene that catered to tourists only 100 feet away. In the end, our time at Monkey Jane’s caused us to miss our check out time from our hotel, it was so enjoyable. When we woke up the next day, a little worse for the wear, we stowed our stuff behind the hotel desk, paid our late check-out fee (worth it) and hit the streets yet again. 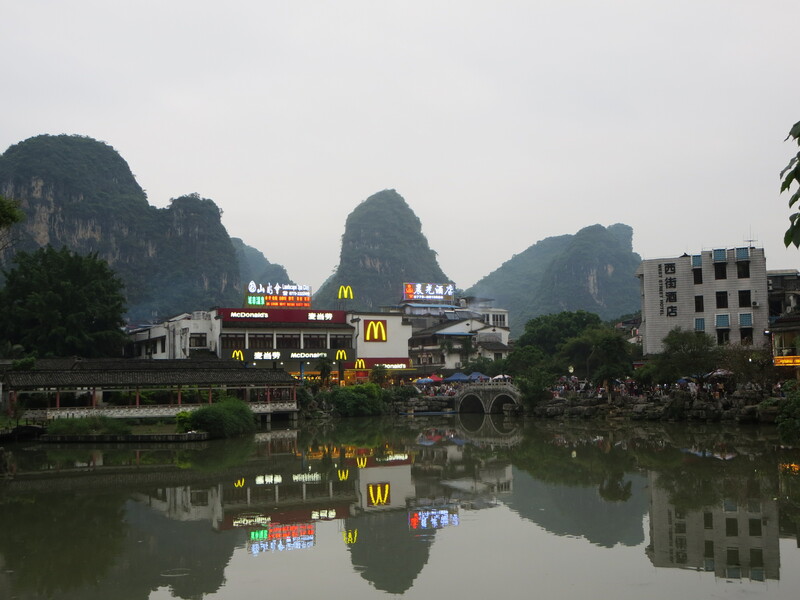 We had done almost all that the city of Yangshuo had to offer, and though we had hoped to rent bicycles and see some the countryside a la carte, the pounding in my head told me that wasn’t going to happen. So instead we had lunch and went to an optical illusion house. It’s exactly what it sounds like, and I hope you like the pictures. This is how Adrianna feels every day when she stands next to Spenser. Adrianna, stop getting murdered by all the animals! The face of pure joy. 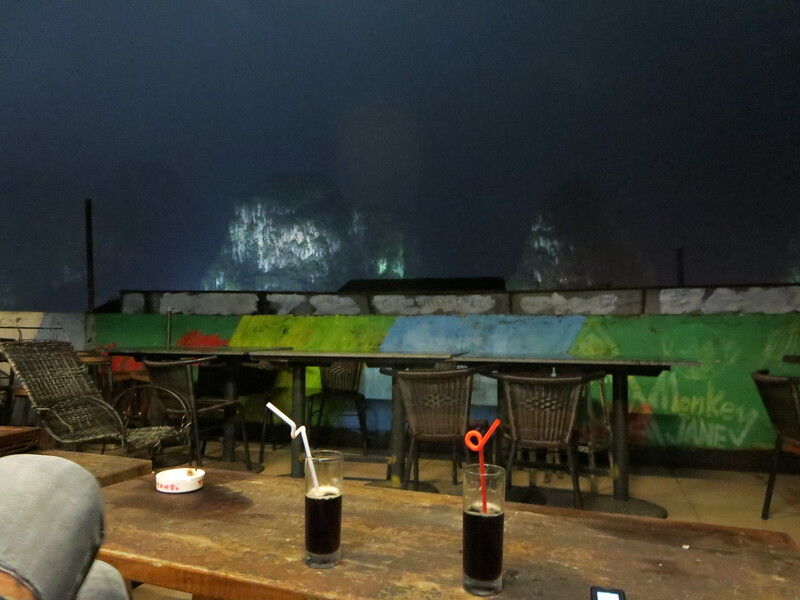 When we finally left Yangshuo that evening on another night bus, I felt exhausted but satisfied. Could I return to Yangshuo and do more? Absolutely! It’s not so small that 40 hours can encompass all the wonders of one of China’s most scenic tourist destination. Do I feel that I made good use of the time I had there? Totally! I’d do it again anytime.